I grew up in a gravy-less household. When my mom made a turkey, she dumped the drippings into a gravy boat and that became the gravy in our family. Needless to say, gravy didn’t make much of an impression on me. However, when I became a teenager, I discovered a whole new world that didn’t conform to the rules our our kitchen. Fries and gravy at the mall was as common as scoping out cute new boys and a stop at the local food court was a required Saturday afternoon activity. The gravy poured over my fries at the local food court had little in common with my mom’s turkey drippings and I admit I was taken in by this dark, salty, thick sauce. However, when I became a vegetarian, gravy quickly disappeared from my radar. While vegetarian gravy obviously exists, for me at the time, it was just something to eat with french fries. I didn’t think much about gravy for many years until I started eating meat again. I was a guest at a friend’s Thanksgiving dinner and she asked me to make the gravy with some leftover pan drippings and some wine. I managed to whip some up and I was pretty impressed with the results. Who knew it was simple to make? Up to that night, no one had told me. Nowadays, gravy and I have become rather acquainted. I can make a mean sausage gravy to serve with Southern style biscuits for breakfast and I also make a mighty fine miso vegan gravy, but one thing I haven’t tried to recreate is poutine. But that changed when I bought myself a little bag of cheese curds from the farmer’s market. This poutine isn’t traditional. Instead of french fries, I use roasted vegetables. And instead of a gravy made with beef drippings, this one is 100% vegan (well, except for the cheese but I hear that this is a worthy substitute). I used a vegan veggie stock cube because that’s what I had on-hand, but any kind of vegetable broth you’ve got on hand would work well here. I also used cornstarch because it’s quick and fuss-free, but you could also create a roux with flour as your starting point. I flavoured the gravy with chipotle because I thought some smoky spice would work well with the roasted vegetables and I was right. This meal is definitely one you’ll want to make again. Elsewhere: Oh boy! It’s been a busy week, writing-wise. Wondering what to do with that can of tomatoes? Check out my post on ReadyMade for some ideas and a recipe. Also on ReadyMade, I suss out some pretty fabulous icy sweet treats all made with sweetened condensed milk. Poppytalk has me gabbing about the weather & making a comforting baked pasta dish. Preheat oven to 450F. Cut potatoes into wedges or fry shapes. Slice carrots on the diagonal. Toss with olive oil, place on a baking sheet and bake for 10 minutes. Break broccoli into florets and cut up stems and add to the rest of the vegetables, giving a quick toss. Bake for another 15 minutes or until vegetables are golden on the outside and done on the inside. Meanwhile, bring the veggie stock to a boil. Add in chipotle and oregano. In a small bowl mix together the cornstarch with a couple teaspoons of cold water. Pour the slurry into the boiling stock and whisk until thickened. Turn down the heat and taste, adding more seasoning if necessary. If the stock is too thin, make more slurry out of cornstarch and cold water and add it to the gravy. 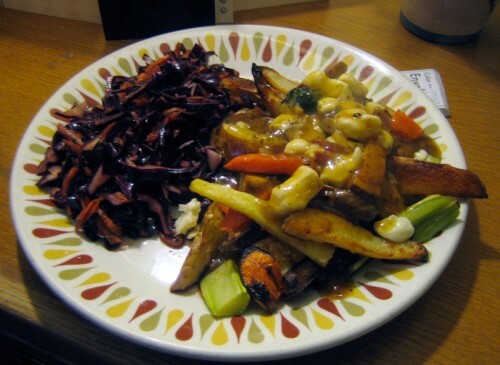 Plate up the roasted vegetables, sprinkle the cheese curds over top and pour over the gravy. I find poutine so interesting and foreign, I hope one day to try it and love it and then make every American I meet eat it. I love gravy! Yum. I use cornstarch too and red wine. I had never heard of poutine before! Looks great though! OMG .. did you just make HEALTHY poutine?? i think i’ve been waiting for this all my life! 🙂 it looks so tasty and satisfying and healthy! Where I come from (the rolling parkways of New Jersey), poutine is otherwise known as “disco fries” and is eaten at 2am at the local diner, usually along with a slice of cheesecake and bottomless cups of terrible coffee. Holy crap that looks and sounds great. Perfect when you want something kind of indulgent, like fries and gravy, (sigh, I miss those days)…but totally healthy…no guilt! I am going to out to get some cheese curds right now! yum to da tum. i had poutine once and i can’t remember where, but i’ve barely heard of it, which makes sad to know what i’ve been missing! i’ll definitely be making some soon, and this is a good version, since i’m doing a pescatarian month in May! Yum! 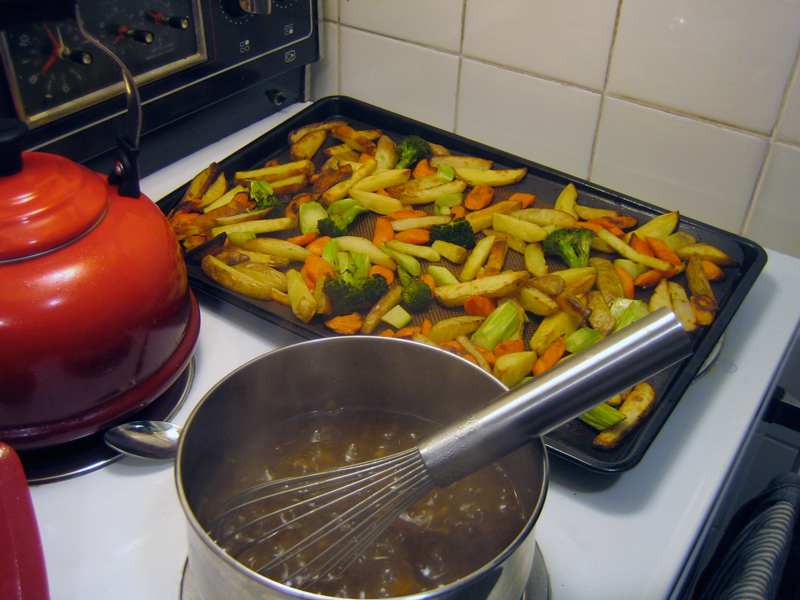 We made poutine often at home, and roasted veggies are an important element! Makes it sooo delicious, and you feel less guilty eating it. Yours looks great. i love a good gravy. And we really don’t eat a lot of meat here, so I need one that is vegan based. Hard for me to give up dairy & fish though. I am so digging this dish!! I have a confession…although I’m Canadian, I’ve never in my life, eaten poutine before. I have seen it listed on the menu at some restaurants but it always scares me away knowing how fatty and rich it is. I think your veggie poutine version will become a quick favourite of mine! I love this idea! I make vegetable fries quite often, generally with some hummus or some variety of dipping sauce. I am definitely going to try this next time, I love poutine. It’s been forever since I’ve had fries dipped in gravy but I’m pretty sure these veggie sticks would be a great alternative. In fact, since I really don’t like fries anymore…I think i would like them better! Ha, so funny you see poutine as foreign, Megan! Nervous, love the sound of disco fries!! Hag, those days are long gone so this is a worthy substitute. Thanks Kimberly, glad to see other at-home poutiners around. Vanillasugar, it’s easy to make a good vegetarian/vegan gravy. I can’t give up cheese curds, though. Bijoux, can’t believe you’ve never tried it. When I was in Montreal last summer, I got my fill! Natalie, fries with hummous? Now I’m curious. Sounds amazing. Dana, give gravy a try! It’s great to use on non-holidays as well! What I want to know, Joanne, is how you’ve gone to not liking fries! I love fries, but I’m very content with roasted vegetables as an at-home sub. Haha Tracy, I know the feeling! Your poor deprived childhood! Good gravy rocks. Preferably the leftovers slurped out of the gravy boat when clearing the table after Sunday lunch. I am a firm believer that food shoud be wet! Oooh! I’ve never made poutine before, but this is definitely encouraging. Pretty and delicious looking! Ha, Helen, I agree about having a deprived childhood! Especially where gravy is concerned. Jan, trust me, it is wonderful. I love poutine, this look awesome! I live in Vancouver too, but have never found cheese curd here, where did you get yours? Lukas, I got mine at the winter farmer’s market, but you can now get them at the summer Trout Lake one. I’ve also purchased them at La Grotto di Formaggio on the Drive & on Granville Island. This looks most excellent. I’ll definitely want to try it out. This looks fabulous and easy! I can’t wait to try it. Mmmm…..and thanks for the tips on where to shop in Vancouver (a few comments back) that would be a great post for us losers who are lost when it comes to where to get good groceries in the city! Thanks Dawna, it’s pretty delicious and easy to whip up. Glad the shopping info was useful Rawbean! Sometimes you just need a bit of a hand to know where to look. This is brilliant!! 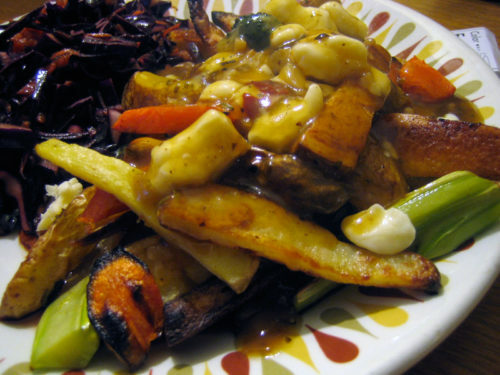 I’ve never thought of doing a roasted vegetable poutine. Ashley, the vegetables remove the guilty. Really and truly. This was really good. My gravy was runny, but I think that was my lack of patience. Thanks! Jess, you can always add in more cornstarch slurry to thicken quickly for next time! …just made this-it was fabulous! So glad you enjoyed this, Brigitte!